Notes: Dutch Iris flowers are good for forcing. 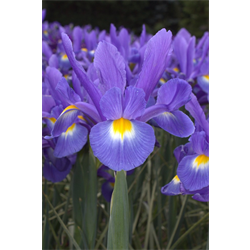 Dutch Iris are a long-lasting, excellent cut flower or border item. If you can resist cutting the flowers for indoor use, they will come back faithfully in moderate southern climates. This purple iris flower features hints of blue and a blotch of yellow on its falls.